A new inductee into the Rock and Roll Hall of Fame, KISS won't be playing at that ceremony. But the members are still very much in the rock 'n' roll business. The sideshow at Dodger Stadium is about to begin as Paul Stanley emerges from his backstage trailer, shirtless and in full kabuki drag: bright red lips, his face painted harlequin white, a black star over his right eye. The singer-guitarist is here to perform with his band KISS but hears his name and walks over to a crowd gathered at the fence. "Arriba!" yells one fan, and Stanley reaches over to shake hands, as dozens of cellphones take snapshots. "Let me see your shoes!" shouts another, and Stanley half-climbs the fence to swing a tasseled silver-and-black platform boot over the top. "Thanks, Paul!" In less than an hour, Stanley and his musical partner of four decades, Gene Simmons, will lead KISS through two short sets of hooks and hard rock riffs as halftime entertainment for an ice hockey game between the Kings and the Ducks. It's another strange gig in the ongoing saga of KISS, which long ago evolved from band to lucrative brand, ready for high-profile special events, reality TV and cradle-to-grave business ventures in the form of KISS Hello Kitty Dolls, KISS comics, books, T-shirts, action figures and restaurants as well as KISS caskets and KISS urns. Designer John Varvatos recruited KISS for his Spring 2014 advertising campaign, putting the band in sharp suits to echo the 1975 album cover for "Dressed to Kill." And next month is the unlikely debut of an arena football team called the L.A. KISS, co-owned by Simmons and Stanley (with band manager Doc McGhee and sports exec Brett Bouchy). This is not standard rock 'n' roll behavior. "This is what I do for a living," jokes Stanley, 62, greeting a friend backstage. "Got to put the kids through school." In one more way, 2014 could be the band's most surprising year since its initial 1970s pop culture explosion, beginning with KISS' induction April 10 into the Rock and Roll Hall of Fame. It welcomes the hard-rock quartet into the critical pantheon that has at times violently rejected KISS and acknowledges the band's huge impact on rock spectacle. The band's stagecraft has grown only bigger and louder, with eruptions of fire and smoke, and members standing like comic book heroes in two-tone makeup and "uniforms" of armor and shades of silver and black, singing anthems of rocking out and getting the girl — and then getting another. The band's hard-charging, catchy guitar rock took the genre to new theatrical heights while helping set the stage for the glam-informed look and sound of the Sunset Strip in the '80s and beyond. "I still believe the heart and soul of this is a band. The music is imperative," says Stanley, who has produced the last two KISS albums and next month releases an autobiography, "Face the Music: A Life Exposed." "Maybe our horizons are broader because we have an opportunity to go other places. Why not? Whether it's a football team or restaurants, people say that's not rock 'n' roll. Let me tell you what's rock 'n' roll: Winning is rock 'n' roll." Being voted into the Hall of Fame is a victory that comes 15 years after the band's initial eligibility and annual outrage from fans. But next month's ceremony at Barclays Center in Brooklyn also means dealing with old wounds and complications that began with the final exit of founding guitarist Ace Frehley and drummer Peter Criss more than a dozen years ago. In their place ever since are lead guitarist Tommy Thayer, 53, and drummer Eric Singer, 55, who both wear the makeup designs of their predecessors (designs owned by Simmons and Stanley). "The naysayers, and some of them are loud, talk about Tommy or Eric being impostors. I think an impostor is a guy up there doing it for a paycheck," says Stanley, back in his trailer and now dressed in his full stage regalia, with black feathers on his shoulders and medallions over his chest of a guitar pick, a feather, a star. "We've never been happier." Any hopes for a reunion in makeup of the four founding members at the Hall of Fame ceremony ended last week with a band decision to not perform in any capacity. A statement on the KISS website read: "This is understandably an emotional situation where there is no way to please everyone." Negotiations with the Hall of Fame stalled, say Simmons and Stanley, who wanted to include Singer and Thayer, while the Rock Hall wanted a reunion of the original quartet in makeup. "Imagine getting onstage and playing with a lineup that does not exist," says Simmons, 64, comparing the situation to a forced reunion with an ex-spouse. Both have bad memories of years of substance abuse by their former partners but say they are happy and proud to accept the award with the former members. Putting the original quartet in makeup was "a nonstarter," says Stanley. Simmons and Stanley questioned whether the former members were up to performing. Reached via email, both Criss and Frehley are working on solo albums and say their problems with drinks and drugs are behind them. Frehley has been sober for seven years. "We should of been able to work it out as grown men; it's a shame we couldn't," writes Criss, who also survived a 2007 breast cancer scare. "My guitar playing, singing, writing, performing and producing skills are as good or better than the past," Frehley writes. "For years, Gene and Paul have been trying to minimize my contributions to the band, even though I designed the famous KISS logo … and designed the trademarked makeup for the Spaceman character." All four said they were open to joining the night's traditional jam session at the end of the night. "That's what the celebration is all about," Frehley writes. Long before being voted into the Rock Hall as a band, Simmons and Stanley were outspoken critics of the rock institution and its rules. "We had issues before this happened. It doesn't turn into a love fest now," says Stanley, but acknowledged, "There are some people who are angry or hurt by this, and I don't want to see that." In the canyon mansion made through seven seasons of "Gene Simmons Family Jewels" on the A&E network (the show was canceled in 2012), Simmons sits behind a desk stacked high with evidence of his place in the universe. There are KISS comics and rolls of KISS Hello Kitty toilet paper, DVDs and an array of magazine covers declaring him a financial wizard. But at the moment, Simmons is somewhere else. His eyes are closed, and he gingerly taps a beat on imaginary drums, then riffs on air guitar and sings along to an old recording of his: "This time I'll get it right / Just give me one more chance tonight." These aren't lightning bolts from the God of Thunder but melodic rock tunes that could have shared the late '60s Top 40 of the Beach Boys or the Animals. The songs are demos from 1977. The controversies over the Hall of Fame and newer members wearing classic makeup are issues mainly for older fans with an emotional attachment to the original band. Simmons calls up a photo on his computer from a stadium show in Stockholm, then another from Lima, Peru. Both show ecstatic young fans in the front rows. "Can you see the faces? That's about 90,000," he says of the crowd. "You see a bald head in there? You think they … about Ace and Peter? They're going, 'Who?' We've been around 40 years, and only two members stayed there the whole time, never quit, no drugs, no booze. "KISS is bigger than anybody in the band." The crowds didn't always come. After KISS' initial round of fame as pop culture figures in the '70s, the band's popularity began to fade. Criss and then Frehley soon left. "What people don't realize is that you don't get any warnings," Stanley recalls of that time. "Nobody says, 'Hey, tomorrow you're not going to fill the arena. Tomorrow your album isn't going to sell.' You fall off the cliff. That is a stunning and stark realization. I don't think anything can prepare you for it." KISS took off the makeup and became MTV stars in the hair-metal era with "Lick It Up" in 1983 and were platinum once again. "The idea was, if we can't exist as a band without makeup, then we don't deserve to exist. Let's take it off and see what we can do." The makeup returned in 1998. In 2009, KISS began recording "Sonic Boom," this time with Singer and Thayer as full members. "Monster" followed in 2012, peaking at No. 3 on the Billboard album chart, though it hasn't reached the gold or platinum status typical of their first decades. "It's very different out there," says Stanley. "If somebody's putting out an album thinking they're going to sell millions, they're going to be disappointed. We didn't do it for that. We did it to reclaim our territory and to see if we could contribute to the KISS legacy. Instead of just living and celebrating our past, being creative and moving forward but still firmly committed into what we've always done." KISS has a history at Dodger Stadium. 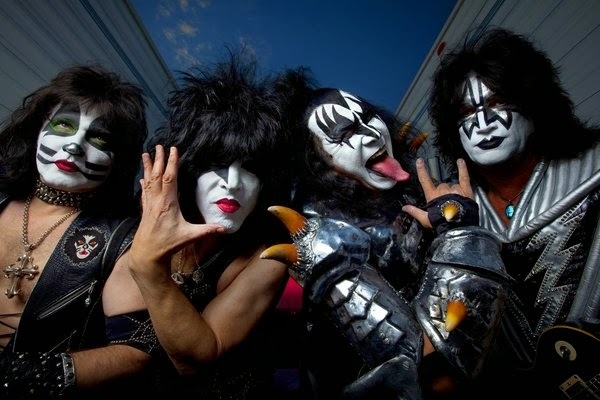 The band launched its 1998 "Psycho Circus" reunion tour there on Halloween night. At the end of the show, the quartet slipped away in a van while fans were cheering but got stuck in traffic on the way to their hotel. Stanley remembers KISS getting out of the van to walk the rest of the way on Sunset Boulevard, still in makeup. "People were going, 'Great costumes!'" This time, the band exits before the main event is over. Thayer steps out of the trailer without makeup looking refreshed. Stanley walks hand-in-hand with his youngest children — ages 2, 4 and 7 — and proudly notes the blues-guitar skills of his 19-year-old, Evan Shane Stanley. "Sooner or later, you'll realize that nothing is more important than family," says Stanley, who no longer hangs a single gold or platinum album award on his walls at home. "If you fight it, you're an idiot." Simmons steps out with all his armor and makeup removed, looking pleased in his socks and a robe, a towel draped over his head. Mission accomplished, he waves goodbye and slowly walks toward the gate and a waiting car with his family to take him back home into the canyons.